Students use this concept map to reinforce their understanding of the digestive system and how structures within that system are related. 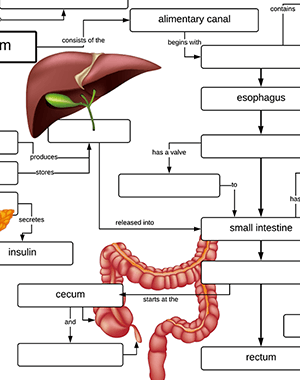 The map follows the structures of the alimentary canal, like the esophagus, small intestine, and large intestine. It also includes accessory organs like the liver and gallbladder. The map was made for anatomy and physiology students but it could also work for biology or health. A word bank is included, but you can make the exercise more challenging by removing the word bank. To edit, choose the google doc file from the links below, then choose “make a copy” from the file menu. That will open up a new version of the file on your own google account that you can edit. This is fantastic ! I will be teaching 2 sections of biology with lab, anatomy and physiology and Bio 101 next year, for the first time; so finding your site is a gold mine! Thank you for making it all accessible!